Atmospheric audio ducting | Watts Up With That? Amateur radio operators are very familiar with atmospheric ducting or “skip” as we call it, which (with the help of the ionosphere when the sun is cooperative) enables some very long distance radio communications well beyond line of sight. The same sometimes holds true for loud audio, such as thunder or sonic booms. See my descriptive graphic below the “continue reading” line. Is this “ducting”?? the Tallahassee National Weather Service office addressed it in a special statement. “We had a lot of calls early Wednesday evening, primarily from the area from Woodville to Crawfordville, about rumbling sounds that sounded like a freight train, with residents fearing it was a tornado. But, it was NOT. The leading edge of thunderstorms was well to the south by that time, and while there were still rumbles of thunder, the severe weather was over. I’d like to know Before someone attributes this phenomena to man made climate change. That remebers me, that once in 1975 on Christmas day, I was able to listen in South of France FM radio from Germany – about 1100 km away. this is consistent with the computer games…………………..
Where I live, we have this all the time. Works best where it’s flat land and fast fronts…..
Don’t suppose you could enjoy that same effect with the gentle “whoosh whoosh” of windmills? Similar low frequencies, and in the right conditions you could get “beating” of the blade’s waves which some have described as less than pleasant. Listening carefully to the audio in that clip, you’ll notice that the background level of the rumbling doesn’t drop when the woman is speaking, as could be expected as the camcorder’s audio compressor/limiter activates if the background audio was being amplified. I lived within a couple of miles of the Lockheed Burbank airport in the late ’50s, and watched from my yard as a U2 launched straight up and out of sight one afternoon, back in the day when they were still top secret. Had no idea what that black thing was, but it made an incredibly loud rumbling that was unmistakeable. The audio in this clip reminded me of that experience. I noticed a similar ducting effect on the surface once. I heard a mariachi band that sounded like it was next to my house. I looked out, didn’t see a band… so I started walking. At each step the mariachi band sounded like it was just over my head, and I kept looking in attics and second stories, but still no band. Finally I found it, 1 mile away, around the edge of a hill! The duct must have been formed by the steep hill on one side and an inversion (or something like that) on the other, with the inversion always maintaining the same “contour line” from the bluff. Operating a (surface based) air search-and-track radar, I once tracked a large surface target over 130 nmi distant. Got a good consistent return for hours. That was an unusually strong duct, but I’ve seen others. The conditions that permit that kind of thing are actually quite unwelcome in the radar world; they also mean unpredictable signal attenuation (blind spots) and lots of clutter (false returns). It sounded like an aircraft engine run (testing). On a smaller scale we can sometimes get this during still evenings – we pick up chants from a football stadium about 8 miles away…. But on a much larger scale, whales use a similar underwater channel to communicate vast distances. This is called the SOFAR channel – http://en.wikipedia.org/wiki/SOFAR_channel refers…. 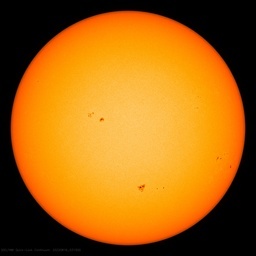 It is amazing that solar science claims there is very little variation in the sun during the solar cycles. Any HAM operator can tell you there are huge differences in ionization levels during the solar cycle, and from cycle to cycle. Solar science seems very concerned with measuring the 10.7 cm (microwave) level of the sun. Does climate respond to 10.7 cm radiation? if not, then climate science will conclude that because there is no correlation between climate and the 10.7 cm radiation, then the sun does not drive climate. Perhaps what drives climate is not the total energy from the sun, rather the energy at wavelengths where the climate is most sensitive. For example, we know that ozone and cloud formation is related to ionization, not simply to the brightness of the sun. First – what (US) hams refer to as skip is not ducting, it is reflection from ionisation layers which vary between 50 and 300 miles high (depending upon which layer, time of day, radiation intensity from the sun etc. etc.). There is typically one reflection. Very infrequently there might be a subsequent reflection from the ground back up and another “bounce”. What you are illustrating in the graphic occurs more at VHF and above frequencies. This is true ducting, where there are two layers of ionization and the signal bounces along between them, sometimes for thousands of miles. This is tropospheric ducting. Both of these rely upon ionized layers in the atmosphere, and only affect electromagnetic signals. For audio “ducting” I would expect the effect to be more like the first type of propagation mentioned above, with a single reflective layer above, and reflections (echoes) going between this layer and the ground. To get an echo (reflection) of audio from air, I think you would be looking for a very strong difference in density over a very short distance. As the echo progressed, I would expect the phase distortion caused by the ode of propagation to cause severe distortion, which might explain the “growling” noise. Where I have problems with this explanation is the intensity of density differences required in air layers, persistent over a long period and large distances. The second problem is that the sound in the video was practically continuous, supposedly for 20 minutes or so. I can buy a thunderclap, which is actually a very short noise, being stretched out for a few seconds – after all tha is what we are used to hearing (the echoes of the thunderclap spike(s)), but to be drawn out so long that thunderclaps merge into one continuous noise … even allowing for “stretching” of the sound as it propagated by reflection (echo) … there would need to be some pretty frequent thunderclaps driving it. Not saying any of this is impossible, but the rather odd and widespread air layers required should show up in other ways, and I would expect metreological records to show this. Otherwise, its more likely noise originating from the polar ice-cap shifting due to global warming — preparing to disintegrate and inundate New York !!! Ducting is caused by having two layers in the atmosphere with different refractive indexes. Snell’s Law describes the Index of Refraction. In a duct you have two of these layers and the signal “bounces” back and forth between them. As a microwave design engineer, I have to plan for ducts in certain areas. The LA basin has a lot of ducting for example. However, there is no model that can predict them. Years ago, Bell Labs looked into them, but never published a model, or even a hint of a model. This is very interesting . . . . I, for one, am glad the National Weather Service was on their toes . .
Anthony, I have a weather question. Why do tornadoes always sound like freight trains, and never passenger trains? I’ve never heard a tornado up close. Do you really hear the clickety-clack like wheels on rails? Sounds like my late hard drive. I was more fascinated by the verbal dialogue in the video…as conjecture takes root. Right at the end of the video there appears to be a stroke of lightning that brings the whole phenomena to an end. What was that. Did a lightening strike change the inversion layers somewhat or did something else occur . Any ideas? As commenters Peak and Hall said above. There is ducting – in atmospheric terms it is usually RF at VHF and higher frequencies in the trophosphere, there is skip which is HF and ionospheric, then there is the ‘half a duct’ or simple refraction most often seen in acoustic waves for phenomena like this. Generally, sound over a long distance is due to an inversion because the speed of sound differs by temperature and is faster in cold air. A RAOB for the time and place in this example would be interesting to examine. Atmospheric refraction can often be detected in the early morning as the ground warms up from the sun but the air above it still cold from the night. Trains and road noise from miles away can be heard where I am. The length of sound in a thunderstorm can provide a clue as to its nature relative to your position. Long rumbles usually indicate horizontal, cloud to cloud, away from you strikes. Many of these at distance with the distortion noted in refraction would well create a rather long rumble. ducting, in the definition I use, requires a symmetrical sandwich. Fiber optic cables are a good example. incident angles are low. it is a refraction with positive feedback for the duct channel. skip is a reflection at a higher angle and asymmetric or not in a ‘pipe’ like a duct. atmospheric reaction to sound waves utilize entirely different phenomena than it does to radio waves at the levels we normally deal with. so I was a bit confused by the terminology in the post. I have heard this sound on several occasions in the Willow Grove and Blue Bell, Pennsylvania area over the last fifteen years. Almost always at night when it has awakened me from sleep. It seemed to go on for far too long to be an aircraft, but I always thought it had to be either that or a missile launch. Usually, I keep trying to go back to sleep while the noise drones on and on, but I did get up to investigate once and it abruptly faded out just like it did in that video before I could pin it down (although I saw no flash of light). I still live in the same area, but haven’t heard that sound in a few years. Coincidentally, that base in the area is scheduled for shutdown and has seen less and less activity. These days I’d probably chalk it up to some kind of jet engine test or perhaps a couple of freight train and this curious “ducting” phenomenon. It sure is cool to see video of someone else hearing it, though. i’d attribute it to a low hovering jet helicopter. there was one here this afternoon – i went out to see what it was. he was maybe half a mile away and maybe 100 ft up but you could only see him when he passed between trees as he moved on. it was olive drab. in florida, the ground is quite flat; not orogenous at all. consequently there are none of the familiar echoes from hills or mountains. thunder sounds flat, muffled. This effect is well known and exploited by submarines and whales in the ocean. At about 1000 meters depth there is a sound ‘channel’ where refraction minimizes losses by steering sound waves into the center of the channel, extending the distances where sound can be detected to thousands of kilometers. I’d say there was a jet plane flying in the duct….. laughed when the woman said, “Don’t go out there…” as if she was expecting a tornado or the Mother Ship to land…. “ducting” would seem to explain everything except for the flash signalling the end of the phenomenon. Any chance this would be a high-altitude atmospheric phenomenon, say high-velocity wind shear with something local a few thousand meters up, like a short-lived mini-jet-stream, culminating in a discharge of electrical energy followed by dissipation of the phenomenon? This would be consistent with the lack of wind at the ground level, and I could imagine something of the sort associated with large weather-system movements that involved an inversion or something of the sort, in which a colder body of air slides above a warmer one; you’d possibly get something like a horizontal tornado if you had the right kind of seed dynamic. It would be invisible at ground level if it happened in clear air or above a cloud cover. I could imagine little air movement at ground level, although you’d expect precipitation due to adiabatic expansion as the warmer low-lying air rose. The video indicates rain, but it’s steadier than I would think something like this would cause — I would expect massive sheets and bursts. But that’s probably why I’m not a meteorologist. days. finally the folks in the area were told it was naval gunfire testing. I’m not buying that was thunder being “ducted”. For twenty continuous minutes? Sudden flash of light and it stops instantly? This reminds me of a different phenomenon where sound is carried across a body of water. Several years ago, I was camping at a state park by a large reservoir. Where we were camping was by a little inlet with campsites on both sides. The drunk people on the other side were about 1/4 mile away, but we could hear them loud and clear like they right next to us. Pretty neat how this stuff works. It is neat that this ducting effect was captured on camera. Now all we need to is to get ball lightning on film. I live about 12 miles east of Seattle and nearly 25 miles from the SEATAC airport and every day we can hear the jets departing like we were next to the airport. The windows and dishes rattle from it. We’re at about the same altitude as the airport and have an unbroken line of sight view of it though we can’t see it from here. I’ve always assumed it was ducting. Anyone heard of the Whispering Gallery in Grand Central Station in NYC? I’ve tried it out many years ago and it’s really bizarre. Two people maybe sixty feet apart and facing away from each other can carry on a conversation in a whisper; The sound travels up and over the arched ceiling. The “whispering gallery” is located on the Grand Central Terminal dining concourse near the famous Oyster Bar & Restaurant. Here, the acoustics of the low ceramic arches can cause a whisper to sound like a shout. Sound impossible? To test it out, you and a friend will have to stand in opposite corners of the large arched entryway. Now face the corner and whisper. Your friend should be able to hear your voice as if you were right next to them, not whispering into a far-away corner. According to experts, this happens because the whisperer’s voice follows the curve of the domed ceiling. The Whispering Gallery is a popular spot for marriage proposals – and a unique place to whisper sweet nothings to your main squeeze. Reddish light reflecting off of inside wall in a few frames, sounds like a spoof, with a kerosene jet heater running behind the camera. Sounds just like one. I live in a village in Surrey on the North Downs. There is a local story that when the British Army exploded the mines at Messines ridge in June 1917, hundreds of miles away in Flanders, the sound of the 500 tons of explosive was heard on the local heath. If this is true, I suppose the sound was bent downwards by the warmer air in the stratosphere (sound travels slower in cold air, not faster as Bryan Leipper says) and could make the distance in one jump. It sounds just like the furnace at a Waste-to-Energy cogeneration plant. We have one at Islip MacArthur Airport. It can be heard at 5 or more miles when conditions are right. It typically runs for 10 to 20 minutes per fuel cycle. Nice recording – mind if I call it a “duct tape”? I have heard of ducting in sound underwater, but not in the atmosphere. I haven’t see the sounding profile that would indicate ducting potential, either. Refraction plus dispersion, on the other hand, are quite common and can create some unusual effects. CAPE CANAVERAL, Fla. — Discovery ended its career as the world’s most flown spaceship Wednesday (March 9, 2011), returning from orbit for the last time and taking off in a new direction as a museum piece…When it landed three minutes before noon EST, Discovery ceased being a reusable rocketship. Coincidence? The noise apparently started about 6:45 pm EST. The shuttle landing was about noon, EST, that day., a difference of 6.8 hours. At 740 miles an hour speed of sound, and assuming the landing and the noise are related, the corresponding distance would have been 5000 miles. That’s quite a tunnel. Sounds like a well test to me… blowing or flaring gas to atmosphere makes a “jet engine/freight train” sound. Unless you can see the gas/flare, you might not be able to place direction. And 20min would be a short test. Or it could be an ESD at a gas plant or compressor station… don’t know where it is or how proximal it might be to some such plant or well, but that would be my guess. Being a spotter I’m reading this article and all comments with interest. I have heard this nose during times when the jet stream was active over head both in Huntsville, AL and up in the foothills of east TN. Also when in TN, I notice many a time when sounds would be thrown a good distance even to the point of hearing normal speech of people out side their homes. As to the question how does a a tornado sound, I was at the Nov. 15, 1989 EF 4 which hit Huntsville, AL. The sound is quite close to what you hear if you witness a rocket engine test, both the water fall to cool the test pad and the blast with a very high pitch which is painful to the inter ear. This sound gets pushed ahead of the tornado and ends once the tornado has passed you. In cases of funnels you do hear a high pitch wail, like it’s carrying it’s own warning system. That roar is usually a sign it’s on the ground. I couldn’t help but notice the voices, clearly they were afraid. If any of the NWS folks are monitoring this post, you need to use this for spotter classes. While it wasn’t a tornado, pretty darn close! On May 18, 1980 I was outside pruning by vineyard when Mt. St. Helens erupted over 300 great-circle miles away. — heard it loud clear — no ducting necessary! I’m living about five miles from the ocean, at an elevation of about 800 feet. The sound from the coast (waves and the local foghorn) gets strongly ducted by the fog. The fog wanders in from the coast, and the sound often comes in with the fog. I’ve always figured that the sound was bouncing off of the earth and the top of the fog, to travel that far and be so clear. When I was fishing commercially on the Pacific Coast, we’d get what we used to call “tunnel ducting” on the VHF radio, typically when a cold front was passing, and we’d hear VHF calls from a couple hundred miles away. As to whether what we’re hearing in the tape is ducting of a thunderstorm … seems doubtful to me, but there is a strong cold front involved, so it seems possible. The world is a mysterious place. In 1970, I lived on a Naval Air Base where we had all manor of jet aircraft A-4 Skyhawks, A-5 Vigilantes, F-4 Phantoms, etc. coming and going, and where we had stationary jet engine testbeds (engine only on an outdoor stationary platform where they turn them > 110% power). This reminds very much of the sounds of distant stationary jet engine testing. The 911 caller said something about an airport some 3-4 miles distant from their location. The flash of light and resolution of the sound agree with that rough distant. Not sure how there would be a flash of light without the sound of a jet engine explosion. Maybe some kind of engine shutdown with subsequent excess fuel flash burnoff? That’s a real pretty cartoon but it doesn’t prove anything. Had a similar thing but visually across Scapa Flow in the Orkney Islands off the north of Scotland, in the early morning when it was very still from the beach you could see across to the other side of the flow which was below the horizon, it looked like it was reflecting off the sky onto the water and lasted for some time till the sun rose higher into the sky. It was not very clear but you could identify some landmarks and features. “Tropospheric bounce” is my theory. It is used to connect North Sea oil rigs into an ISDN network on the UK mainland. It takes a lot of energy, though, to pump out enough signal to get a reliable bounce. That will be two cents please. BTW – Glenn said it sounds just like a kerosene jet heater running behind the camera. At one point the woman said the ground was shaking. One of the titles also mentioned that. While operating radar over various oceans I have experienced ducting. You could get contacts that were hundreds of miles outside your radar range limit. Also we used to tune in civilian radio from around the world while flying missions over the Indian Ocean. Usually associated with an inversion layer if I remember correctly. This sounds like an effect similar to a first hand account in Thunder Below, written by Eugene Flukey, the most decorated living Admiral in the U.S. Navy, who commanded the most successful submarine in WWII. He recalls being on his submarine in the Sea of Okhotsk, watching a convoy that was apparently very close. With their binoculars they could see smoke from the funnels and activity on board. After about 10 minutes, the entire convoy suddenly shimmered and disappeared. It appears that atmospheric ducting made the convoy appear from hundreds of miles away. I believe it was a jet engine on a test stand ,that was ducted some how from some airbase or airport close by. not uncommon for the time period of this sound. I have heard them run many times while in the Air Force. I live nearby where this happened and can provide a small amount of info. There are no nearby industrial facilities. This area is very rural with almost nothing for many miles to the E, W, and S. Tallahassee is about 10-20 miles north. No oil or gas wells in the area to be tested (I know this being a former DSTer). Very flat terrain so with all the vegetation it is difficult to see anything lower than 45 degrees in the sky. Nearest airport is near Tallahassee about 10 miles NW of there. Nearest train track is at least 30 miles away. This area gets very few tornadoes but many severe thunderstorms. After/during passage of a TS or landfalling hurricane, the area does get tornadoes. I’d say that based on my experience living here that I’d be somewhat afraid too if I had heard that. I did not hear it (am about 10 miles away). My question after seeing/hearing that video is whether there’s a racetrack anywhere nearby. That’s what it sounded like to me. I live in Tally, and didn’t hear it. But there isn’t anything of the industrial nature around here to cause this kind of sound, and certianly no rocket/jet testing. Our Airport is nothing to speak of and I doubt any test like that would happen without making the local news, as getting our airport upgraded and commercially attractive has been a political goal for a few years now. Kerosene Jet heaters aren’t exactly common in these parts either……..I don’t know why though, I mean, it’s not like we go decades at a time without recorded snowfall or anything. When I was at NAS Fallon NV in the mid `80’s we’d have to check the upper air sounding for conditions which would cause “audio ducting” as you called it. If the conditions were ‘right’ some of the bombing ranges around the area were closed because the sound of the bombs would be refracted right at the town of Fallon, which wasn’t appreciated by the residents. When I started doing acoustic predictions in the `80 while on the USS Midway I was shocked to discover how limited the ranges were most of the time. Sure you could get a nice duct occasionally and catch a sub out at 60nm but most of the time a sub could be in periscope (and torpedo) range but sonar would not pick it up. We spotted a periscope once between us and another ship (about 200yards) but the sub wasn’t on sonar. A possible source for this noise could engine testing at Eglin AFB, home of the 96th Air Base Wing. This air base is located 150 miles upwind from Talahassee. I expect that a lot of engine testing occurs there. Smooth water on Choctawhatchee Bay could also act as a proximal reflector for eastbound sound. This differential refractive index thing is what allows light to be transmitted through fiber optic cables. Microwatt light pulses can be reliably received over 2400 miles from the source using this technique. I get this all the time. The closest train track is 20 miles away on the other side of the river but every once in a while, I hear a train horn and engine noise that sounds like it is just out in the front pasture. I live near the approach pattern of a naval air station. We get a similar (although shorter) type of phenomenon almost every time it is cloudy. On a clear day, the noise from a passing F-18 might only be heard for 5 seconds, about the same time it would be easily visible as it passes over. However on very cloudy days, the volume of the noise is greatly amplified and it can last for up to 2 or 3 minutes. Are you suggesting this is a once in at least 26 year event? I’m not saying that’s impossible but I would think it highly improbable that the AFB could cause that and not have done it in the 26 years I’ve been living here. It doesn’t really explain that whole flash of light and suddenly stop thing either. I realize anecdotal evidence is not exactly proof of anything, but I don’t believe this lines up with an engine test at all. Do we have any idea what the probability is for sound ducting to occur between here and the AFB while they were testing an engine at night just after a thunderstorm? apparently homeland security is conducting unreported exercises around florida.